The Frisco School of Music is the largest music school in the city having taught over 9000 students since we opened in the fall of 2000. As Frisco’s original music school more music students have taken lessons here than anywhere else! While you are here researching the best school for you, please consider the benefits of becoming a student here and find out why we are Frisco’s number one choice for music lessons. 1. The widest range of music lessons available in one location. Piano, Guitar, Bass, Mandolin, Ukulele, Banjo, Drums, Violin, Viola, Voice, Flute, Clarinet, Alto Sax and Trumpet lessons plus our Rock School Band Series - all in one location. Busy families can save drive time and money by scheduling multiple lessons or multiple family members on the same day. Our School is 7,000 sq. ft. with 28 teaching studios, and with over 40 teachers you can imagine the flexibility we have in helping you select a lesson schedule time. People of all ages and levels come here to take music lessons. Even adults who are new to music or returning to study! With over 40 teachers, all with University training and/or professional performance experience - you can be confident that we have the right teacher to meet your needs. Our music teachers are dedicated to learning about your personal musical goals and helping you to achieve them, and we incorporate music theory and sight reading into your lessons, right along with helping you learn your favorite songs while improving your new performance skills. In addition to their teaching credentials, our teachers have warm personalities, are extremely friendly and dedicated to teaching you the style of music that you want to learn. Ask about our Practice Club - learning can be fun! Whether you have a young child who wants to try out lessons for the first time, or a high school student preparing for college entrance or a professional career in music, your personalized lessons will help you accomplish your dreams. Private and Group Music Lessons and Band Classes are by appointment and are first come, first serve so contact us today to arrange your first lesson!. Over 6,000 students taught, and voted "Best in Education" by Frisco Style Magazine. Visit our testimonial page to see what our students are saying. Every year, aspiring music teachers start their own studio, and a year or two later it's closed. 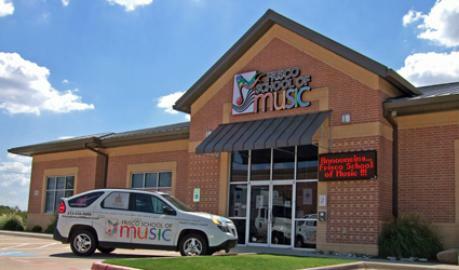 The Frisco School of Music has a proven track record of offering quality music lessons, year round. Our full time mission is teaching music. Work on the music YOU enjoy! 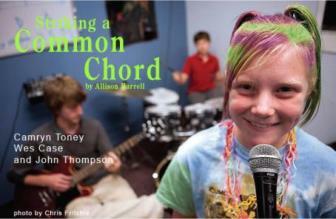 We teach a wide range of musical styles, from classical piano to rock and metal, sacred to modern pop and jazz music. Instead of waiting in a music retail store showroom, our clients enjoy a spacious, professional waiting room with comfortable chairs, kids coloring table station, and Wi-Fi. We also provide observation windows on every door so that you can watch your child's lesson while you wait. Or if you prefer you can sit in on their lesson anytime you like (for private students). Our rooms are stocked with everything you need for lessons, including amps, stereos, full acoustic drum kits, keyboards, pianos and more. Plus, teachers have an iPad in every studio to incorporate fun music learning apps and sample music video examples, etc. All you need to bring is your instrument. We have spent thousands of dollars on our facility to offer sound-resistant studios and observation windows. Our beginning group music lab classes have Music Mania Show Days five times per year, Achievement Graduations, Coffee House Shows, Theory Test and Music Showcase. Our Star Power Series is for students who want many more performances, including weekly Band rehearsals, two yearly Band Blowout Shows and all of the above mentioned performance oppotunities as well. See our Performance and Events page for details on these events. We have six Office Staff who are available at the front Music Desk to assist our clients. We staff our Music Desk starting at 9:00 or 10:00am through closing each day Monday through Saturdays and Sundays starting at 2:00pm. Our goal is to return all phone inquiries as soon as possible in a friendly and courteous manner. 9. Convenient location in the "heart" of Frisco. We are located on Preston Road, just north of Main Street on the NW corner, across from the Brinkman Ranch. Due to our central location, our school is convenient to Frisco residents on both the east and west sides of Preston, plus McKinney, Prosper, Celina, Savannah, The Colony, and Plano. Visit the location page for more details. Although most of our music students are with us for four and five years or more, our School does not require semester minimums or yearly commitments. We plan on a year of lessons at enrollment (or start with a trial four lesson series), however if you cannot stay at the School you simply notify our Music Desk on the first of the month and finish out that month in a positive way with your teacher.